Kieran Halpin is the special guest at Irvine Folk Club on Wednesday 6th February and that means it is in the ‘unmissable’ category for fans of live folk music. A career that started in 1974, with 17 albums to his name, thousands of gigs played at venues all over the world, a prolific songwriter of great quality are the key musical facts about Mr Halpin. What the facts don’t tell you is his continuing search for new approaches to present his songs nor does it describe the powerful nature of a live Kieran Halpin performance. All his live gigs resonate with his compellingly powerful yet intimate and intense performance. He plays acoustic guitar, regales the audience with explanations of where each song comes from and links it all together with some very funny asides. He is a man of very, dry wit. Kieran Halpin has played on a number of occasions at the Irvine Club. He is always invited back because he is such a unique writer and performer. Kieran is also one of the hardest working artists with upwards of 160 gigs each year with all the travelling that entails and still he finds time to write songs. DON’T MISS what promises to be a very special night. The Club meets in Vineburgh Community Centre in Quarry Road, starts at 8pm and it’s BYOB. Irvine Folk Club is fortunate indeed to be welcoming the fine duo of Ian Davison & Carissa Bovill as guests on Wednesday 23rd January. It’s been too long since this very talented duo sang at the Irvine Club – but they are well worth the wait. Glaswegian Ian is frequently described as the songwriter’s songwriter. 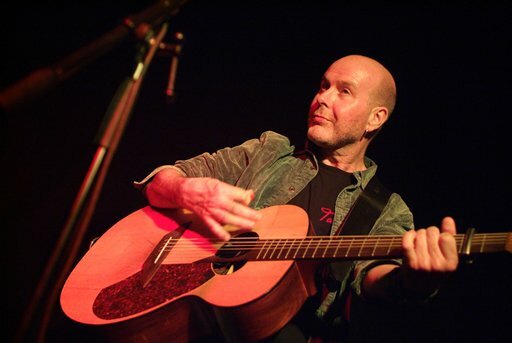 He has written over 260 songs, a number of which have been recorded by artists including Peggy Seeger, Adam McNaughtan and Brian McNeil and has 12 albums to his name. The most recent one featured his most political songs and kicks off with ‘Mandela Danced’ – a song marking the amazing day that Nelson Mandela came to Glasgow and did indeed dance! Ian is a prolific and high quality songwriter. He writes emotional love songs, nostalgic songs about his home town, songs of peace and about war and humanity. He has also written a number of songs for children. Ian also has extensive experience as a songwriting tutor for secondary and special needs students. Brian McNeil his long term friend and colleague, describing Ian’s songwriting says ’It’s done with rock hard conviction and delivered with a gentle authority that persuades as much as it harangues’. With Ian will be Carissa Bovill. She is a very talented singer, multi-instrumentalist, composer, arranger and accompanist. Music has been a dominant theme in her life since childhood. She started piano and fiddle lessons – classical and traditional – at age 8. Now with a Music Honours Degree from the RSAMD, she finds time to teach Scottish music and song to the Junior Section at the RSAMD at weekends. PLEASE CONSIDER INVITING A FRIEND to visit the club with you. Also, if you know anyone who lives locally and is interested in folk music, ask them for their email address and subscribe to the ‘news feed’ on the club website for them. If they know who is coming, they might be tempted along. if they don’t know, they may be stuck with Coronation Street. You know it makes sense! Red Hook Rapids are the first guests of 2013 at Irvine Folk Club on Wednesday 9th January. A new band to the Irvine Club, this acoustic trio comes from the Inverness area and play a mix of folk, Americana and country. That said, up until the end of 2012, Red Hook Rapids was a duo! Donald Forbes and Ally Macleod are the original Red Hook Rapids members. They got together in Summer 2010 when Ally was recording a solo album Astor Place and Donald was the sound engineer. A shared devotion to a particular strand of American music ultimately resulted in Red Hook Rapids coming about. Donald plays lead guitar and he and Ally share lead vocals. They were both established singers and songwriters in their own right prior to teaming up as a duo. They share a love of strong harmonies and describe their music as folk with country influences playing a hybrid of British and American material. They have one album to their name – Closer To Home – released in June last year. Red Hook Rapids became a trio in December 2012 when guitarist Stewart Campbell joined them. So, shake off any start-of-the-year blues and get along to Irvine Folk Club in Vineburgh Community Centre on Wednesday 9th January to hear Red Hook Rapids. The Club starts at 8pm and it’s BYOB. Finally, the 20th Celtic Connections bursts into life on 17th January and continues until 3rd February. There is a huge guest list and umpteen venues so still time to make plans to mosey along and soak up the atmosphere. Leaflets detailing Folk Club Guests for 2013 are available now. Please collect some the next time you are at the club and distribute these to your friends. Guests up to the end of May 2013 are: Wed 9th Jan – Redhook Rapids, Wed 23rd Jan – Ian Davidson & Clarissa Bovill, Wed 6th Feb – Kieran Halpin, Wed 20th Feb – Luckenbooth, Wed 6th Mar – Maurice Dickson, Wed 20th Mar – Brian Peters, Wed 3rd Apr – Two Can Dan, Wed 17th Apr – Jed Grimes, Wed 1st May – Kent Duchaine, Wed 15th May – Barron Brady and Wed 28th May – My Sweet Patootie. 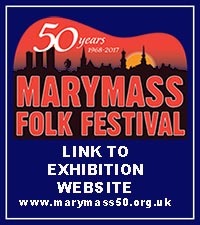 Looking ahead to the Summer, The 46th Marymass Folk Festival runs from Wed 21st – Sunday 25th August, 2013. Alastair McDonald – Wednesday 12th December This will be a great night and last club night of the year – Don’t miss it. The always popular Alastair McDonald will be the final Irvine Folk Club guest for 2012 when he tops the bill at the Club on Wednesday 12th December. Alasdair McDonald at the UCS Concert at Celtic Connections. 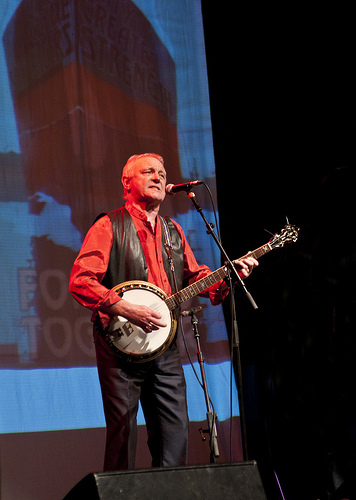 Alastair is the folk-singing, jazz banjo player or the jazz banjo playing folk singer – it depends where he’s appearing! He is equally at home in folk clubs, jazz venues, theatres, concert halls or churches. His TV and Radio appearances are too numerous to mention and likewise the number of albums he has recorded. Suffice to say that since becoming a fulltime performer in 1970, Alastair has built up a successful career in Scotland and globally too. Glasgow born Alastair emigrated with his family at the age of eight to Australia. It was while growing up in the Australian outback that he developed an interest in ‘home made’ entertainment. Returning to Scotland four years later, there was a growing pop scene and skiffle had also arrived. At just 21, Alastair was already regarded as one of the leading jazz banjo players. As years passed Alastair’s musical horizons extended and took him into variety shows, pantos, plays, TV and Radio work. His continued popularity is down to his commitment to entertain – akin to the philosophy of the late Johnny Silvo. 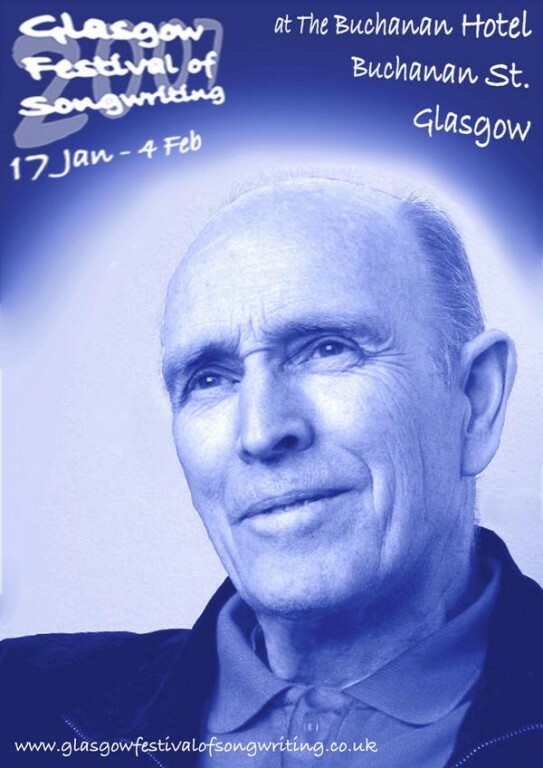 Performances by Alastair McDonald can be described by words like wholesome, helpful, uplifting, cautionary. Always he plays to entertain the audience. Alastair is a very popular guest at the Irvine Club and you are advised to get along early on the 12th December to Vineburgh Community Centre in Quarry Road. The Club starts at 8pm and it’s BYOB. Please note, Irvine Folk Club starts up again on Wednesday 9th January with Redhook Rapids – there’s two of them! The duo from Northern Ireland Fil Campbell & Tom McFarland fill the guest spot at Irvine Folk Club on Wednesday 28th November. Fil is a singer and songwriter, her husband Tom is a fine percussionist and both are well known and respected musicians on the folk circuit. Fil has recently released her sixth CD A Place Of My Own. It is a collection of material first released in the 1930’s and 40’s by female singers. The album was produced by husband Tom. Fil & Tom have fairly lengthy links with Irvine Folk Club. For those who have not heard them, prepare for a wide range of material from blues and folk and country to contemporary as well as self-penned stuff. Fil does not have the classic modern female ‘folk’ voice. It is much softer and less hard-edged. Tom is a talented multi-instrumentalist, backing vocalist and studio recording engineer. His interest in percussion stretches to instruments from all over the world and his instruments include bodhran, congas, bongos, the African djembe…and really just about anything that can be hit or shaken! Both Fil & Tom are involved with teaching music. Be prepared to be entertained by the easy on the ear Fil Campbell & Tom McFarland at Irvine Folk Club on Wednesday 28th November with some understated and subtle arrangements and fine singing. The Club meets in Vineburgh Community Centre, starts at 8pm and it’s BYOB. Elsewhere, The Star Folk Club is on the move. They will be flitting from their present venue at The Saints to basement of The Admiral in Waterloo Street. The first night there is Tuesday 12th February. The Admiral is just five minutes from Glasgow Central and yes, The Star will be meeting on Tuesday nights at The Admiral. Finally, Martin Fay – one of the founder members of The Chieftains – has died. Martin played fiddle for almost 40 years with the band. STV have posted some old programmes on Youtube that will be of interest to club members. The series was Kay’s Originals by Billy Kay. I have provided two links of particular interest, one which includes Adam McNaughtan and another with Danny Kyle. Adam looks very youthful and it is great to see such high quality footage of Danny. It will bring back memories for lots of people. Broom Bezzums is a duo based in Germany, with their origins in England and they are the guests at Irvine Folk Club on Wednesday 14th November. Mark Bloomer and Andrew Caddie are Broom Bezzums. With four albums to their name, these two talented multi-instrumentalists have a sound which might lead you to think that there were more than two people on the stage. Hands, feet and mouths are all used to create the Broom Bezzums’ sound. From Northumberland, Andrew Caddie cites Alistair Anderson as one of his early musical influences when the great man came to Andrew’s first school to demonstrate the concertina and pipes. And it was Kathryn Tickell who taught Andrew fiddle and pipes. After busking around Europe, Andrew did a degree in Folk & Traditional Music at Newcastle and since then has been a much sought after musician. Mark is a Brummie and his first love is drumming. He was a drummer with several Birmingham based punk, Indie and psychedelic rock outfits. From there he gravitated to more roots based music and left for a two week holiday in Ireland – he stayed four years! Playing on the Cork session scene, he became a stalwart guitarist, and then hit the road again to travel Europe and ended up in Germany. Between them, Mark and Andrew play Northumbrian Pipes, Guitars, Mandola, Fiddle and Bass Drum. They both do vocals. Their recently released fourth album Winterman has mostly traditional songs with a Winter or Christmas theme. They also do some self-penned material. For impressive musicianship, easy charm and good material then get along to Irvine Folk Club on 14th November to hear Broom Bezzums. The Club meets at Vineburgh Community Centre. It starts at 8pm and it’s BYOB. Bram Taylor is the guest at Irvine Folk Club on Wednesday 31st October – a man who by common consent is a no-frills, down-to-earth, easy-on-the-ear performer. Expect clear and strong vocals, an entertaining sense of humour and an excellent selection of material. From Leigh in Lancashire, Bram’s parents were keen that their son play in the local Brass Band but somehow, young Bram moved to the guitar. Starting off playing with various duos and trios, Bram eventually went solo. He now has ten albums to his name, the most recent being Jokers & Rogues released in January this year. Bram is an experienced performer on both the UK and international folk music scene and has built up a reputation for his fine singing. His touring takes him all over Europe, the USA and of course the UK. He has played at the Mariposa Festival in Ontario a couple of times and was particularly pleased when he was playing there alongside his heroes from the sixties Gordon Lightfoot and Don McLean. Bram’s vocal strengths mean he is a confident acapella singer and his instrumental accompaniment is on duet concertina and acoustic guitar. His material is a mix of traditional and contemporary. Peggy Gordon, Ralph McTell’s Weather The Storm, Bogie’s Bonnie Belle and Sing Me A Song Mr Bloom might all feature in a Bram Taylor set. He describes himself as a collector and interpreter of songs – whatever their vintage. His method of selection is simple – is it a good song? So, after you’ve been guising, celebrate Hallow’een by listening to Bram Taylor at Irvine Folk Club. All witches and warlocks welcome at Vineburgh Community Centre in Quarry Road for an 8pm start. It’s BYOB and that goes for Treacle Scones too! Just when you thought most kind of musical combinations had been heard at Irvine Folk Club…think again. Vicki Swan and Jonny Dyer are the Club guests on Wednesday 17th October and they are a unique duo combining a mastery of a variety of instruments, good harmony singing and an extremely varied repertoire. Based in Essex, this husband and wife duo started off as a very talented instrumentals only partnership. They have since emerged as impressive songwriters and arrangers and singers. Vicki Swan is half Swedish and a second generation piper who started out on the musical ladder as a five year old. She studied double bass at the Royal College of Music where she eventually became principal double bass. Jonny Dyer had been singing choral music, soul and jazz for as long as he can remember and although offered a place at Colchester Institute to study music, elected to do a Masters in Historic Building Engineering. Between them they excel at playing Scottish Smallpipes, the Nyckelharpa (a kind of keyed fiddle closely related to the Hurdy Gurdy), Flute, Double Bass, Guitars, Accordion, Piano and Low Whistle. Expect to hear amazing jigs, murder ballads, Swedish songs, self-penned songs and traditional material with a modern interpretation. Vicki and Jonny also do a range of workshops including guitar technique and repertoire; developing accompaniment skills and techniques for creating original tunes. Their most recent album is Stones On The Ground and like all of their releases, earned good coverage on national and local radio and good press reviews.